(Nanowerk News) Just as the invention of nonstick pans was a boon for chefs, a new type of nanoscale surface that bacteria can’t stick to holds promise for applications in the food processing, medicine and even shipping industries. The technology, developed collaboratively by researchers from Cornell University and Rensselaer Polytechnic Institute, uses an electrochemical process called anodization to create nanoscale pores that change the electrical charge and surface energy of a metal surface, which in turn exerts a repulsive force on bacterial cells and prevents attachment and biofilm formation. 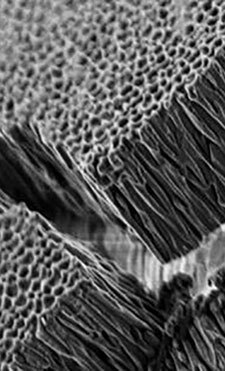 These pores can be as small as 15 nanometers; a sheet of paper is about 100,000 nanometers thick. 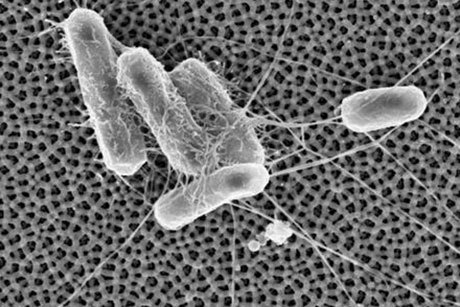 When the anodization process was applied to aluminum, it created a nanoporous surface called alumina, which proved effective in preventing surrogates of two well-known pathogens, Escherichia coli O157:H7 and Listeria monocytogenes, from attaching, according to a study recently published in the journal Biofouling ("Alumina surfaces with nanoscale topography reduce attachment and biofilm formation by Escherichia coli and Listeria spp."). The study also investigates how the size of the nanopores changes the repulsive forces on bacteria. “It’s probably one of the lowest-cost possibilities to manufacture a nanostructure on a metallic surface,” said Carmen Moraru, associate professor of food science and the paper’s senior author. Guoping Feng, a research associate in Moraru’s lab, is the paper’s first author. Anodized metals could be used to prevent buildups of biofilms – slick communities of bacteria that adhere to surfaces and are tricky to remove – in biomedical clean rooms and in equipment parts that are hard to reach or clean, Moraru said. There are other strategies for limiting bacterial attachment to surfaces, including chemicals and bactericides, but these have limited applications, especially when it comes to food processing, Moraru said. With food processing, surfaces must meet food safety guidelines and be inert to food that they may contact. Anodized metal could also have marine applications, such as keeping ship hulls free of algae. Future work will investigate the repulsive effect of these surfaces on other bacteria, and the use of other anodized materials for this purpose. The collaborating group from Rensselaer Polytechnic Institute is led by Diana Borca-Tasciuc, associate professor of mechanical, aerospace and nuclear engineering.